On this page, you can find more than 100+ CV examples from 18 different job sectors. Each CV example is accompanied by a free CV template that you can download and use, relevant tips related to the specific job and a right-hand column outlining key facts about the job; entry requirements, salary, working hours and skills/competencies. It is recommended to tailor your CV to the particular job you are applying for, for instance, by using the same terms, terminologies and jargon that are specific to the job or the field you want to work in. You can use these CV examples to help write or improve your own CV; do not simply copy/paste parts which are not applicable to you or the job you are applying for. This is an excellent example of how the top part of your CV should look like; the candidate’s name is written in a big font (20 points), emphasised (bold) and centred on the page. The heading is not cluttered by other irrelevant information such as marital status, gender, nationality, date of birth, number of children, etc. I am a friendly and outgoing Customer Service Officer with a passion for retail and business. My studies and my previous work experience have all been in these areas, and I am currently looking to progress my career in a more challenging role. I have excellent communications skills which have enabled me to build strong relationships with customers, colleagues and external suppliers. I have previously managed a number of projects to a successful outcome, and I have the excellent ability to supervise, manage and motivate other team members. It is evident that the candidate wishes to progress to a managerial role and rightly mentions project management and leading a team as their strengths. The candidate is very clear on their experiences and abilities and gives appropriate examples to illustrate them. The length of the statement is just about right; four short sentences. The candidate has smartly included the option “Achievements” section on their CV to highlight a couple of their main accomplishments. This is particularly a good idea since prospective employers tend to scan rather than intensively read a CV. July 2016 – Present	Customer Service Officer	Elite Retail Ltd. Dates include months, which give the prospective employer a much better idea of the duration of each employment rather than just mentioning the year. The “Qualifications” section is another optional part of a CV that can be utilised to mention some qualifications or training courses that are relevant to the job. The purpose of the skills section of a CV is for candidates to mention some key skills that will assist them in doing their jobs properly. 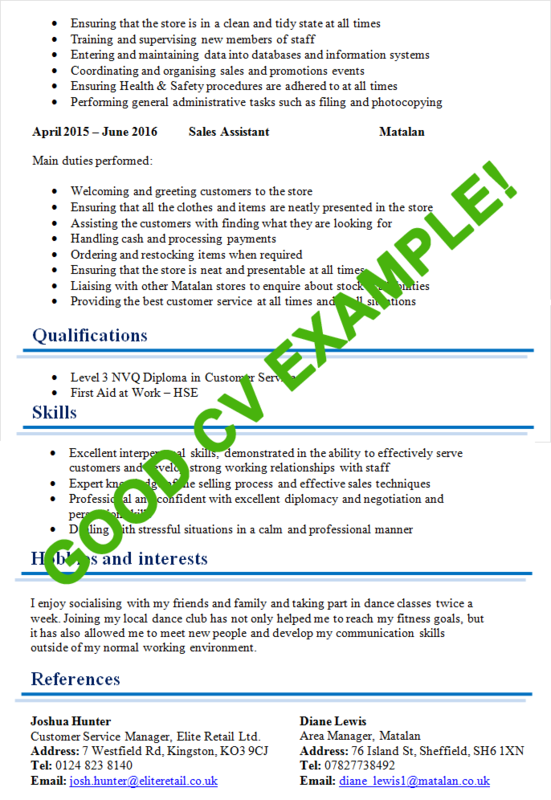 It can be seen from this example that the candidate has really thought about some of the skills that are required for the job that they are applying for and has mentioned them. They have not simply listed “excellent communication skills” or similar vague and generic phrases. I enjoy socialising with my friends and family and taking part in dance classes twice a week. Joining my local dance club has not only helped me to reach my fitness goals, but it has also allowed me to meet new people and develop my communication skills outside of my normal working environment. The hobbies and interests section is a good place to mention some of your hobbies that are related or relevant to the job. In this instance, the candidate has clearly mentioned that their participation in extracurricular activities further develops their skills which they can then utilise in their career. Customer Service Manager, Elite Retail Ltd.
1) List down one or two Referees with their job title, company name and contact details. In this instance, the candidate has chosen the first option and has nicely presented all the relevant details that are required. It is unnecessary to have “Curriculum Vitae” or “CV” as the header of a CV; it is quite obvious what the document is. Instead, the heading of a CV should be the candidate’s name in a big font (20 points), emphasised (bold) and centred on the page. It is highly recommended to omit date of birth, gender and nationality from the CV as these things are optional and may even harm your chances of being invited for an interview. The prefix “ADDRESS” is not required, and other prefixes such as “MOB” and “E-MAIL” should not be capitalised for presentational purposes and because IT GIVES THE IMPRESSION THAT ONE IS SHOUTING. I am hardworking Administrative Officer with excellent communication skills. I can work in team and on my own. I enjoy challenges and strive to achieve the best results. I have excellent organisational skills and I’m good with people. I believe that I can help your company to run better if you employ me. The personal statement contains too many clichés and lacks any force or power behind the words because it doesn’t give any concrete examples of these skills being utilised in the real world. The aim of the personal profile is to be bold and sell yourself as a viable candidate for the job. The closing statement, “I believe that I can help your company to run better…”, is vague, boring and weak. How can you help the business run better? Which aspects of the business? In what way? The candidate doesn’t list down the relevant modules or units that they completed during their studies. It is unrealistic to expect the prospective employers to be aware of all courses/qualifications and their respective modules. Instead of mentioning irrelevant information such as primary school details, the candidate can better utilise the space by specifying the relevant modules that they have studied and their specific grades/results. Once again, the candidate doesn’t properly utilise this part of their CV to fully sell themselves. In the employment section, it is highly recommended to mention the tasks, duties and responsibilities of the jobs that one held. No months are mentioned in the dates so it will be very difficult for a hiring manager to judge whether this candidate started work as an Admin Assistant in January, December or any other month of 2016! The purpose of the skills section of a CV is for candidates to mention some key skills that will assist them in doing their jobs properly. Although playing the Violin is a definitely a skill; how will the ability to play this musical instrument aid someone to be a better officer worker? In my spare time, I enjoy socialising with my friends and family. I regularly take Violin classess which I enjoy very much. The candidate doesn’t mention any particular hobbies or interests that may be relevant to the job that they are applying for. The dreaded Violin is back and, once again, it doesn’t really add any additional value to the CV. General rule of thumb: when in doubt, leave it out. Judging from the referee’s surname and address; we can safely conclude that the referee is, in fact, the candidate’s mother. Having family members as your references introduces a ‘conflict of interest’ (bias) into the situation and is consequently not very well received by the recruiters. There is no mention of the referee’s company or job position. FINAL TIP: The key to writing a successful CV is to fully tailor your CV to the job that you are applying for. Get inspiration from other CV examples listed above; use the same terminologies, mention the same skills that are required for the job and don’t forget to send a covering letter with your application.